The next time you throw a wobbly at your Spectrum for refusing to load your favourite game, or for crashing six points short of the million, have a heart. Don’t you think the little beast might just be lonely, pining for the company of other computers? Desperate for chipchat, it has been sitting there, watching all those millions of bits of chipblowing chatter chuntering along the telephone lines, willing you to buy it a modem, plug in and get involved. No wonder your Spectrum gets depressed, with the communications revolution passing it by! Now, we at the CRASH Clinic for Depressed Spectrums have commenced an in depth study of modem mania, and hope to be able to pass on useful snippets of information for the benefit of you and your computer. In Part One of Modems Operandi, Jeremy Spencer and Graeme Kidd take a look at Micronet — a growing corner of British Telecom’s Prestel database. Set up in 1979 (coincidentally, the last year Dash Ed allowed Lloyd Mangram to have a birthday), Prestel was the first large scale viewdata service in the world. Run by British Telecom, Prestel is a massive database containing some 350,000 frames of information many of which are used by independent Information Providers to publish electronically. Unlike Ceefax and Oracle, the teletext services broadcast by the BBC and ITV, communication with Prestel is two-way. On Prestel, you can respond to invitations to order goods and can send messages to other users as well as just select and read frames. Prestel is accessed via a telephone line, and while you could splash out on a special TV set which contains all the hardware needed, as a Spectrum owner it would be much more sensible to get hold of a modem which is capable of 1200/75 Baud operation. One such is the VTX5000, designed very much with Prestel and Micronet in mind, and currently available for around £50. If you are really serious about joining the communications revolution, then a multi function Modem would be your best bet, which allows you to select from a range of Baud rates and even communicate according to the American Bell telephone standard, but you could end up spending a lot of money! If Micronet is your main interest, such a modem would be overkill. 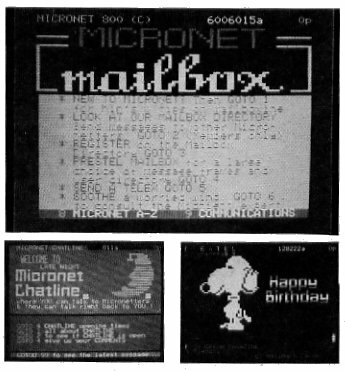 Micronet was launched in March 1983 as a joint venture between British Telecom and EMAP, and from the start was intended as a service for the home computer enthusiast. Living inside Prestel, Micronet charges a subscription (£10 a quarter) which also allows you to go into the rest of Prestel if you wish. So what’s it all about? Like the rest of Prestel, Micronet consists of lots of pages of information which you wander through by keying in a number for the next page you want to take a look at. Using the service is rather like sitting down in front of a very large book and getting someone to turn the pages for you. CRASH signed up with Micronet a few weeks ago, and we have been wandering through its pages ever since — and still haven’t explored all the possibilities it offers. Perhaps the most entertaining facility offered on Micronet (when the Pandora computer hasn’t got a headache, that is) is the Chatline service. When you join Micronet you are given a mailbox number — ours is 105845851 — and people can send you messages by going to a message sending frame, using your mailbox number as the address and typing in their text. This is all very well, but unless you know someone on Micronet, there’s a limit to the fun you can have sending strangers messages. Chatline is the Micronet version of CB Radio and allows people to put a frame of information on general view. Normally available between 6pm and midnight, Chatline lives at page 811 on Micronet and is rather like a moving bulletin board. Essentially there are up to 100 pages available for Chatline messages, with one message on each page. Everyone logged on to Micronet can look at the Chatline pages, and for 2p a time anyone can send an electronic message to the world via Chat line. As the 101st message is received by the Chatline controller it is added to the end of the string of pages and can be accessed by everyone else, and the 1st page in the stream is deleted to make room for it. Chatline has proved immensely popular — so much so that it recently ousted the more worldly Cityservice from 2nd place as most accessed area of Prestel. You can wander up and down the stream of messages seeing what other people have to say for themselves, and if a message catches your interest particularly you can always send a mailbox message to its author direct. What better way could there be of finding new friends on the system? Interestingly, Chatline messages are not censored by the editorial staff as most other publicly broadcast information is, which leads to some interesting material appearing! Don’t get any ideas about placing a few rude messages on the Chatline though — the Micronet staff are not above phoning up offenders and issuing warnings, or even disconnecting persistent offenders. A whole range of services is offered on Micronet, from a news section which can be up to-the-minute, literally, to advice on technical matters, quizzes, features and even an Agony Auntie! You can order hardware, software and even Tupperware by going to an advertiser’s frame and keying in the response that asks them to send you the goods. Don’t go mad though... you get charged for the goodies you’ve ordered on your quarterly Prestel Bill. Software can be downloaded via the telephone line onto your own cassette and you can buy many of the commercially produced programs for a reduced price this way. There are also a number of programs which can be downloaded for free, which is a fun way of adding to your software library without typing in boring listings from boring magazines (dig dig!). Page 8000011 is well worth examining — it contains the Index to the Spectrum Microbase, and all sorts of goodies relevant to Spectrum owners can be found from this page, including the famed MicroMouse, the world’s most lovable electronic gossip columnist???? Geddit Squeaky!?!? There are some 30,000 pages in Micronet, and the whole system is continually updated, with new features being added daily. Part of the fun of logging on to Micronet is to see what’s happened since you were last online, and every time you sign on there’s always a chance that there’s a message waiting for you in your mailbox. Hours of fun indeed, but what’s it all cost? Apart from the quarterly subscription to Micronet and the phone bill, there’s no access charge to Prestel or Micronet providing you don’t want to log on during the peak times, which are 9am to 6pm weekdays and 8am to 1pm on Saturdays. Peak time is painfully expensive — you’ll be charged 5p for every minute you’re on line by Prestel, and then there’s the phone bill to think of... Nearly everyone in the country can dial up Prestel on the local call rate, and if you’re using the service while it’s free, then an hour’s connection should cost less than 50p. See you on the ’Net soon folks... but please, no Hotline votes to our Mailbox... AAAARGH!